Today, Mike Hubbard and his cohorts rule over most elected state officials in Alabama. Only a few are not beholden to his group and they have reason to fear Hubbard. Through shady deals, manipulation, threats and the accumulation of money, Hubbard has taken control of every aspect of the GOP save the Chairmanship of the ALGOP, and redefined the definition of conservative. Storming the State House - How was it done? - Mike Hubbard Indian Gambling Money? Mike Hubbard Storming the State House - Money Came From ?? http://www.alreporter.com/al-politics/political-news/state-news/3677-storming-the-statehouse-and-the-game-of-quid-pro-quo.html - Speaker Mike Hubbard of Alabama benefited from his position. The latest political news. Who is running for statewide office? Read it all in Alabama's conservative newspaper. Vote Conservative Christian - Encourage People in your church to Vote the Liberals Out. The national news media respects and fears the Tea Party movement. We get credit for a lot of things we have done, and not done. In these difficult days, we need to confront our elected officials and encourage them to do the right thing. Alabama Tea Party, holds regular events and tea parties in cities across Alabama in 2013 Click for more info: Alabama Tea Party Come to the Welcome Back Rally in Montgomery in February this year. 2. cautiously moderate or meaning purposefully low: a conservative estimate. 3. traditional definition in style or manner; avoiding novelty or showiness: conservative suit. 4. ( often initial capital letter ) of or pertaining to the Conservative party. 5. having the power or tendency to conserve; preservative. 6. a person who is conservative in principles, actions, habits, etc. 7. a supporter of conservative political policies. 8. ( initial capital letter ) a member of a conservative political party, esp. the Conservative party in Great Britain. Alabama voters to decide on 11 statewide constitutional amendments on November 6, 2012. How are conservatives Voting on these amendments? Information about elections across the state. A conservative adheres to principles of definition of conservatism like - limited government, personal responsibility and moral values, agreeing with George Washington's Farewell Address that "religion and morality are indispensable supports" to political prosperity. The basis of conservatism is a desire for less government interference or less centralized authority or more individual freedom . . .
Ratings of Alabama Legislature View conservative score card of the Alabama Legislature on many key votes. This information compiled by the old Alabama Christian Coalition which was then headed up by John Giles. How Conservative or Liberal is your State Senator or Representative? Ratings based on many key votes in Alabama Legislature. These ratings are the major basis for our endorsements. Read about Eminent Domain, our Legislature failed to take action to protect our property rights. 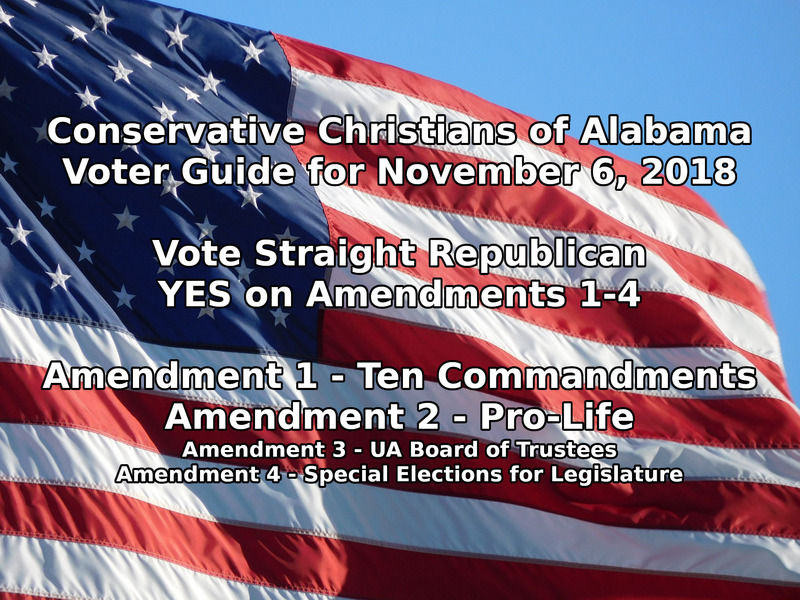 The voter guides of Conservative Christians and the Alabama Christian Coalition Voter Guides are often confused. In the days when John Giles headed up the Alabama Christian Coalition, the voter guides and stands on the issues of Conservative Christians was virtually identical. The national Christian Coalition and Pat Robertson have lost their creditability because of the weird stand they have taken on many issues. For example, last year Pat Robertson endorsed liberal Rudy Guiliauni for President, which was a shock to the conservative community. Then there was the famous Billion Dollar Bob Tax Plan in Alabama. The National Director of the Christian Coalition, Roberta Combs, came to Alabama and held a press conference to endorse this massive tax increase. Roberta Combs called this tax increase the "Christian thing to do". This was so unusual that even the Wall Street Journal made comments about it. Many people felt that Pat Robertson and Roberta Combs had lost their creditability, and their were many rumors that they would say anything for money. Conservative News - June 11. All Americans find this conservative web site to be their home. We lead the pack and lead the charge for conservatism. For Previous endorsements - July 18, 2006. Parker Griffith is trying to make a political comeback. Parker Griffith for Congress 2014 - This time he is circulating a petition to be on the ballot as an independent candidate candidate for Congress. Can Parker Griffith get the necessary signatures to be on ballot as an independent? Congressman Parker Griffith - - Parker Griffith Congress Candidate - - The Parker Griffith Congress Is this an attempt to peal off votes from Mo Brooks so that a Democrat can be elected? The first bumper stickers appeared shortly before World War II and they were flag-like, as they were attached to the bumper by wires. Gill replaced the wire attachments with pressure sensitive adhesive, and as a result bumper stickers became more widespread and practical. These became known as bumper stickers for bumpers. Christians Should Exit or Exodus Public Schools? Attend Alabama Home School Convention held every year in June. Every year the annual Alabama Home School Convention strives to bring local and national home school speakers. It is produced by a homeschooling family so they understand what you want to hear. Attendees want to hear informative workshops not just sales pitches. You can also browse the large exhibit hall and visit with your favorite vendors. Many of the exhibitors have sales during the convention. Homeschoolers across the state can meet and join support groups. You can learn more about the laws in governing Alabama homeschooling such as cover schools and reporting. Learn how to home school in a relaxed and intimate environment in Homeschooling For Excellence 101. Stay up to date with all the activities by joining the email list. The history and philosophy of Christian education proves that it is a profound success story. History shows that America's greatest leaders in the founding of our nation came from the philosophy and application of homeschooling. 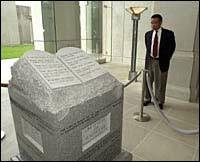 Conservative Christians of Alabama thank you for visiting our site, please return for updates.